Ever purchase some specialty flour like cake or whole wheat, only to have it sit there for a year and never have any need for it again? Determined not to let that happen to my recently purchased whole wheat flour, I decided to try out this recipe for scones. 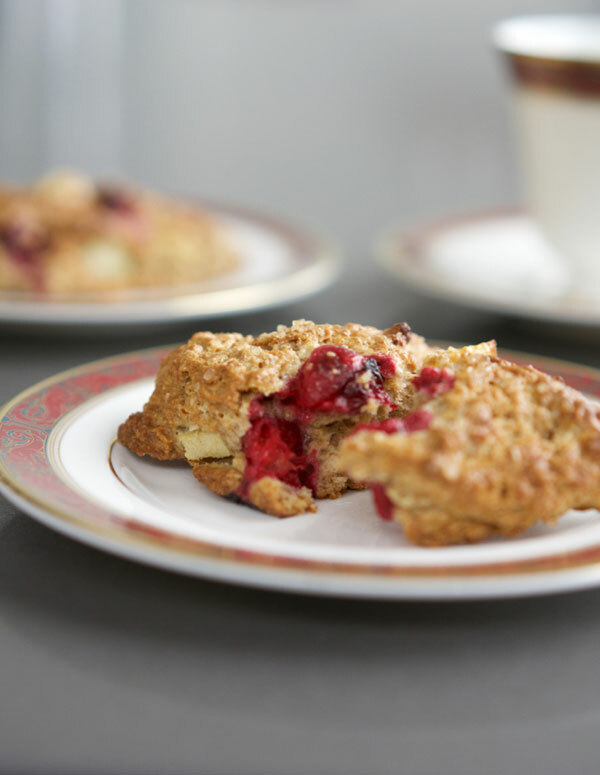 While this scone is not the buttery, crisp on the outside, melt-in-your-mouth scone of my dreams, they were a great mid-day snack and would be a lovely addition to any brunch. Bonus: unlike their buttery brethren, these will actually leave you feeling good after you eat them. Based somewhat on a recipe from Epicurious, I changed things up by using fresh apples and cranberries rather than dried. I also substituted fresh pressed apple cider for the frozen concentrate, and I didn’t have buttermilk so went with the traditional substitution of milk and vinegar (1/2 cup milk with 1/2 tbsp milk). I also didn’t want to add yet another type of flour to my pantry so used rolled oats instead of oat flour. Upon following the recipe I found the dough was very sticky and the scones lost their shape in the oven. To minimize the loss of shape, I suggest chilling the shaped dough on the baking sheet in the fridge for 20 minutes before popping them into the oven. 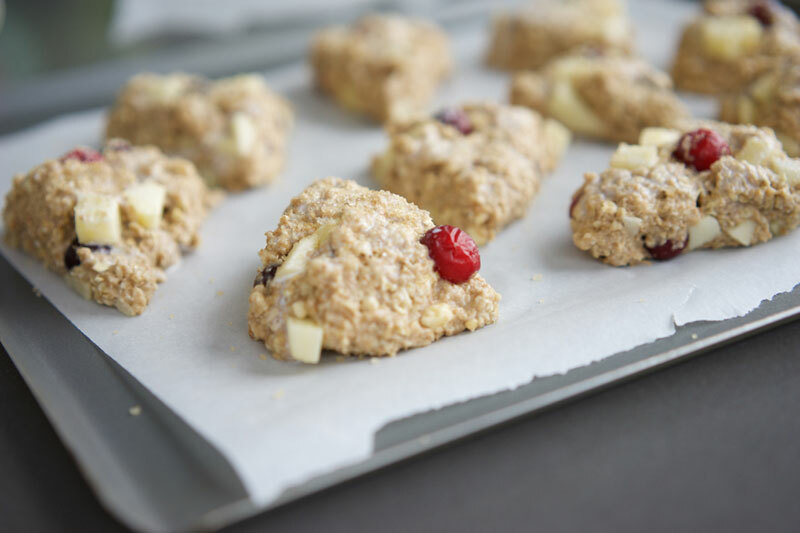 If you don’t want to make 12 all at once, these also freeze quite well—place shaped scones onto a baking sheet and freeze in a single layer; remove from sheet and wrap in plastic or a ziplock freezer bag. 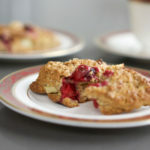 A healthy take on scones with whole grains and fresh fruit, a great snack or addition to brunch. Preheat oven to 375°. Line a baking sheet with parchment paper. Prep work surface with plastic wrap to roll and shape dough onto. Combine first 8 ingredients in a large bowl, blend. 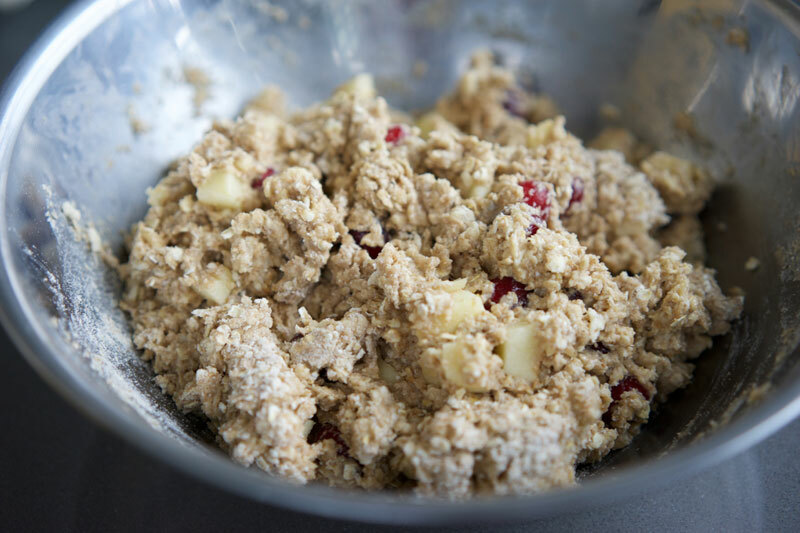 Using a pastry cutter or 2 knives, cut in butter until mixture resembles coarse meal. 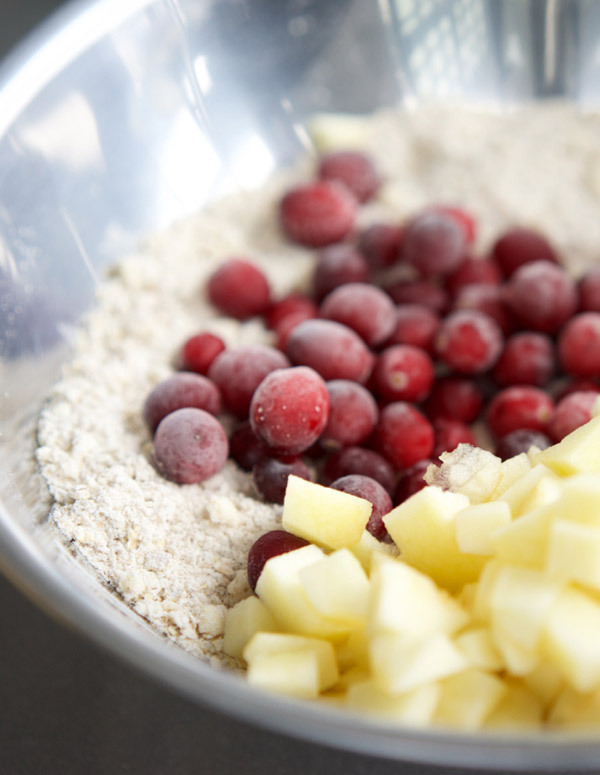 Add cranberries and apples and toss together. Whisk 1/2 cup buttermilk, cider and egg in a small bowl to combine. Add buttermilk, tossing until evenly moistened. Knead 2–3 turns in the bowl, then turn out onto the prepared plastic wrap, shaping into two 6" disks. Cut each disc into 6 wedges. Arrange scones onto baking sheet, spacing 1" apart. Place baking sheet in fridge for 20 minutes. Remove baking sheet from fridge, brush with half and half, and sprinkle with coarse sugar. Bake until puffed and golden, and a tester inserted into the centre comes out clean, about 20 minutes. Serve warm. I have a confession. I hate spring. At least, I hate spring in Toronto. Here we are, into April, positively dying for some warmth and sunshine but instead experience snow, rain and freezing winds. Meanwhile, citizens of Vancouver and New York are enjoying cherry blossoms while wearing light spring jackets, admiring retail windows full of short sleeves and strappy shoes that actually make sense for the time of year! Ok, it could be worse, at least it’s not quite as bad as Montreal in March! But I digress. What our Toronto springs do allow is the ability to enjoy those hearty, wintery dishes just a little while longer before the barbecues are opened up for the season and gelato cravings begin to take hold. 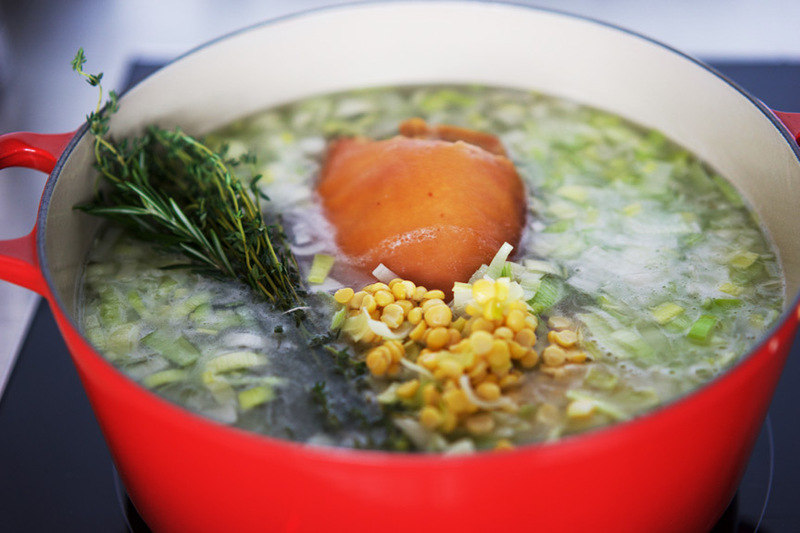 This Split Pea Soup is a classic—yellow peas and leeks, brightened with the brilliant addition of celery root. 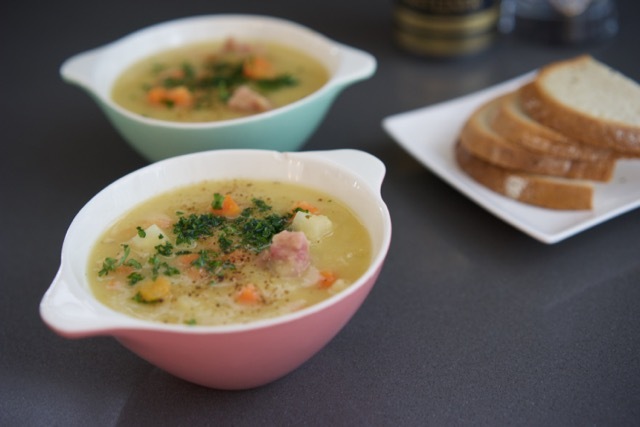 For me, to simmer split pea soup with anything other than a ham hock would be sacrilege. The meat on the bone and the smokey flavours a good ham hock imparts are worlds apart from a boneless ham you might pickup at a supermarket. This recipe is based on one from Epicurious. I did make a few modifications to boost the flavours a bit, however. You’ll find my version below. Enjoy while dreaming of buds on trees, the smell of wet springtime earth and imagining the warm glow of sun on your face. 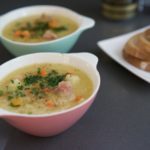 Comforting soup flavoured with a smokey, salty ham hock, with celery root and carrots to brighten up the flavours. In a large bowl, soak peas overnight with enough cold water to cover by 2 inches, and drain. In a 7 quart heavy pot heat olive oil over medium heat, and add leeks. Cover and sweat leeks for 5 minutes until translucent. Avoid browning, they should still be white. 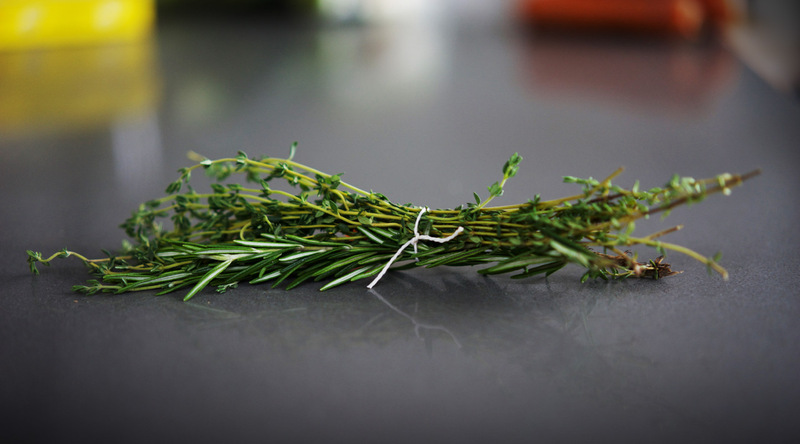 Tie the thyme and rosemary sprigs together with kitchen twine. Add the sprigs to the pot, together with water, stock, ham hock, bay leaves and salt. Simmer, uncovered, for 45 minutes, skimming the foam from the top of the pot as it cooks. 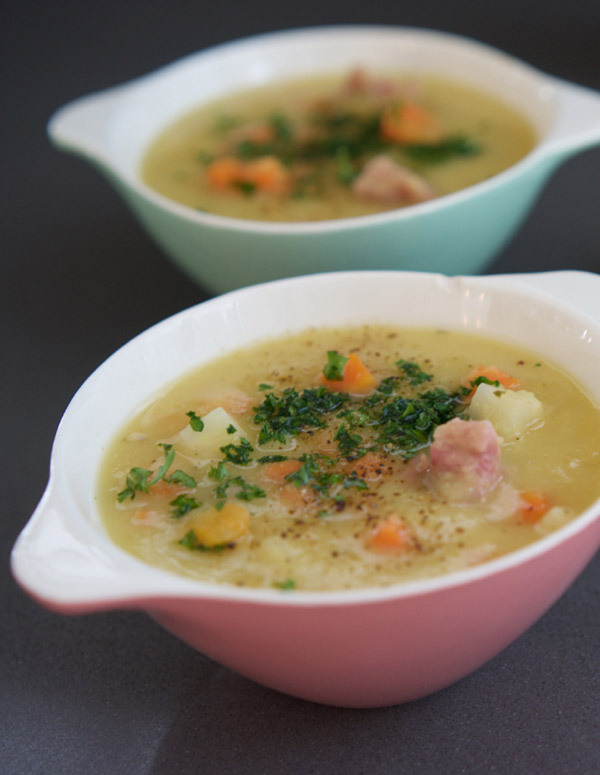 Once the peas are tender, remove the ham hock and reserve on a plate. Discard herb bundle and bay leaves. Using an immersion blender, puree the peas until smooth. Peel the celery root and cut into 1/4" dice. Add to pureed soup and simmer, stirring occasionally for 20 minutes. Peel and dice carrots into 1/4" dice, add to pot and simmer until tender, about 15 minutes. 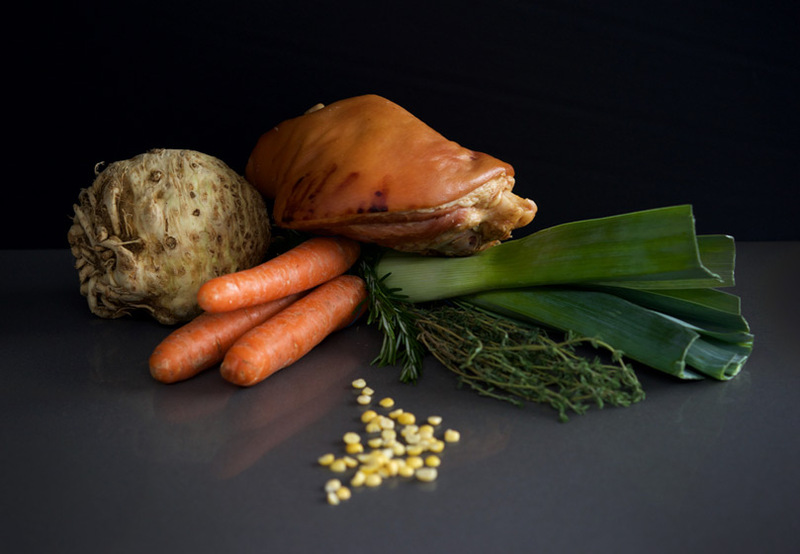 Remove meat from ham hock and discard skin and bones. Chop meat and add to soup. Give it a final taste check for salt and pepper. Serve sprinkled with fresh parsley and some freshly ground pepper.